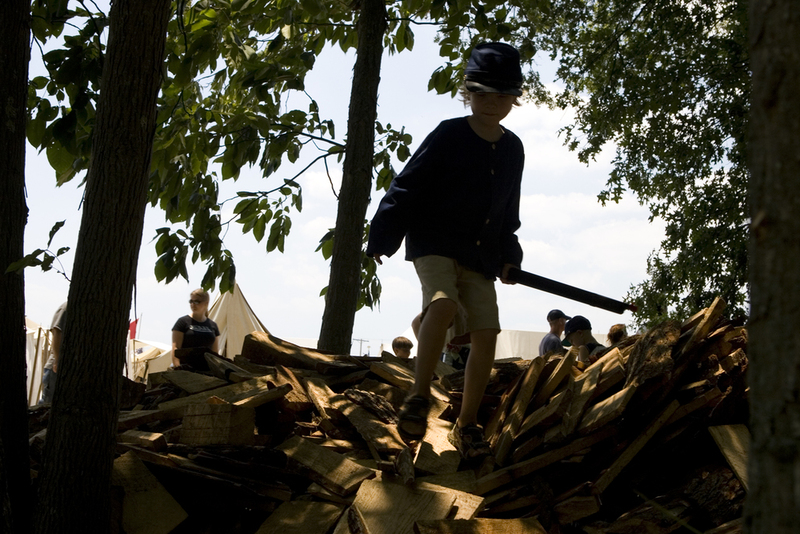 A young boy in silhouette storms down a pile of logs, burnishing his wooden sword. White peaks repeat atop a plane of green. Their abstraction and geometry flatten a real world image of a row of antique canvas military tents. 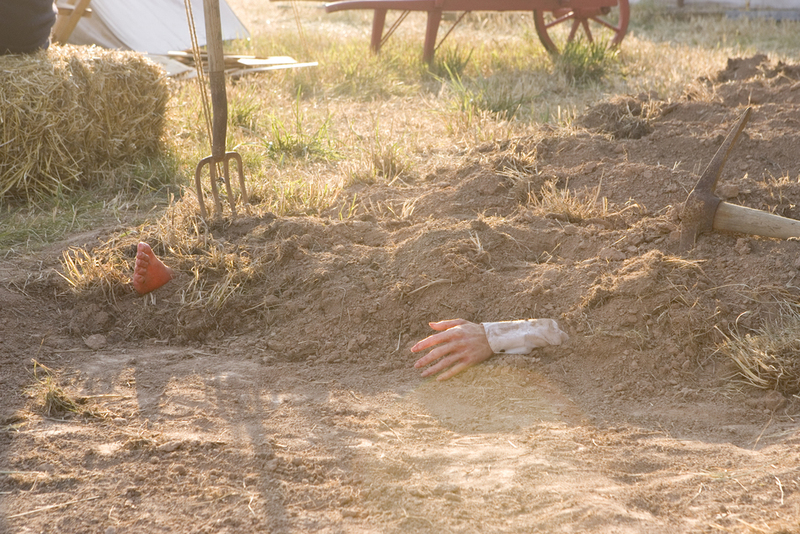 The colonial costumed man lies on the grass, his tri-cornered hat fallen carelessly to the side, his grimaced face frozen as he finishes a day of playing and performing history. Beside him, a tourist’s corpulent body relaxes from the day’s interactions. My photographs of historical reenactments, living history museums, the participants and the tourist public are the interstitial moments to history, yet the actual history does not matter. These tourists on vacation to teach their children about the past, to partake of their weekend warrior hobby or to simply enjoy some time outside eating a hotdog are more important in their reflection of today than in a past replayed. These figures and their surroundings exist outside of history, as they mutate into entertainment and recreation. 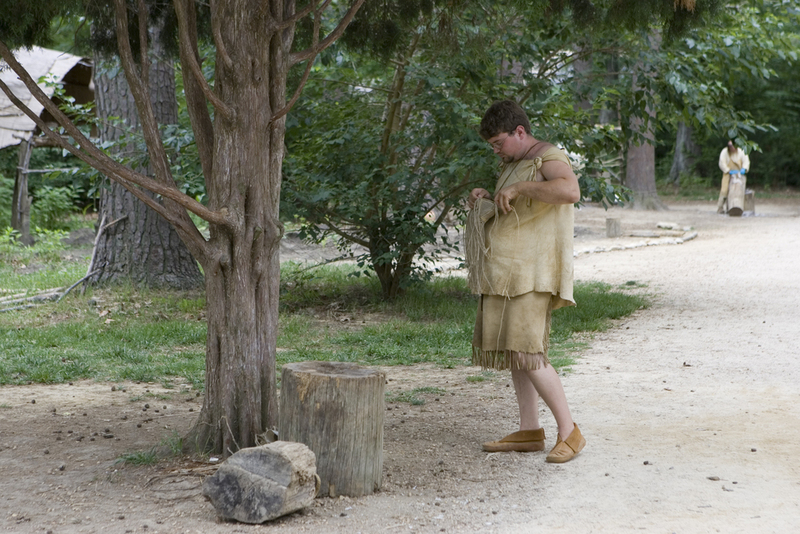 Historically, images of reenactment have been used for education and entertainment in the exclusive settings of books, films and museum displays. My photographs show the contextual nature of viewing “history” and in so doing, remove the frame of accuracy. As the historicity of the images disappear, the viewer is left to decide did these people really look like this and what did actually happen? Ranging from banal to descriptive and from confrontational to elliptical, these images all accept several possible histories. These are my Memorial Days.